Adorn the bond between you and your mummy with this Amazing Gift Box of Assorted Chocolates that will make it lovelier on this Mothers Day. This Gift transparent pack stuffed with 18 pcs. 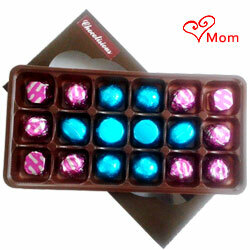 assorted handmade Chocolates is ideal to mesmerize your loved ones.